At rest the heart pumps around 5L of blood around the body every minute, but this can increase massively during exercise. In order to achieve this high output efficiently the heart works through a carefully controlled sequence with every heart beat – this sequence of events is known as the cardiac cycle. The above table shows the range of pressures present throughout the heart during the cardiac cycle. Knowing these values often help to understand the progression between different stages of the cycle, for example the pulmonary artery has a systolic pressure of 25mmHg, so the right ventricle must be able to match this force in order to successfully eject blood. 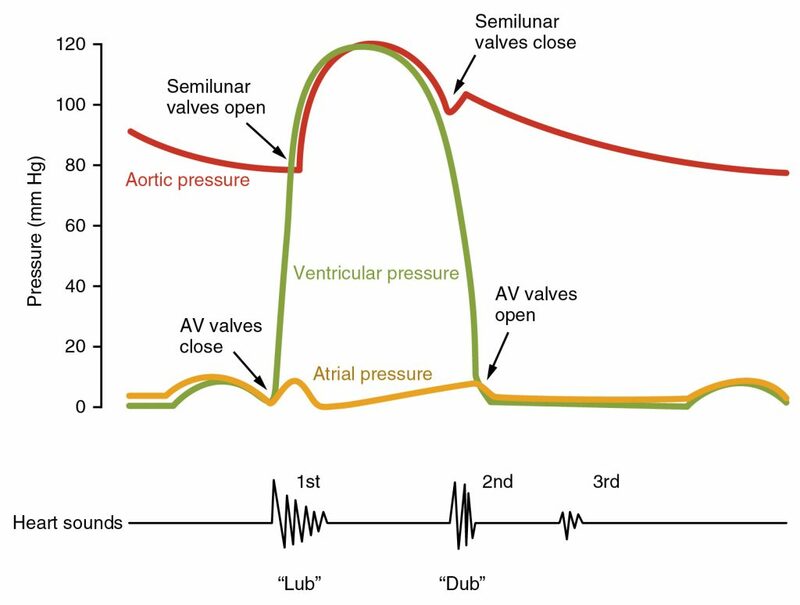 In this article we will discuss each of the phases in more detail; describing the changes in pressure and the actions of the heart valves in the cardiac cycle. You can read more on the anatomy of the cardiac valves here. The ventricles are filled with blood in two stages – diastole (heart relaxation) and atrial systole (contraction of the atria). In diastole both the atria and the ventricles are relaxed. Blood flows from the vena cava and pulmonary veins into the right and left atria respectively, before flowing directly into the ventricles. The ventricles fill with blood at a steadily decreasing rate, until the pressure in the ventricles is equal to that in the veins. At the end of diastole the atria contract, squirting a small amount of extra blood into the ventricles. This increases the pressure in the ventricles so that it is now higher than that in the atria, causing the atrioventricular valves (mitral/tricuspid) to close. As contraction begins both sets of valves are closed, meaning that no blood can escape from the ventricles. The start of systole therefore massively increases the pressure within the ventricles, ready to eject blood into the aorta and pulmonary trunk. The stage of isovolumetric contraction lasts for approximately 50ms while the pressure builds. Once the pressure in the ventricles exceeds the pressure in the aorta/pulmonary trunk the outflow valves (aortic/pulmonary) open. Blood is pumped from the heart into the great arteries. At the end of systole, around 330ms later, the ventricles begin to relax and this decrease in pressure compared to the aorta causes the valves to close. As well as this, blood begins to flow backwards through the outflow valves, which also contributes to the closure of the valves. At the end of the outflow phase both sets of valves are closed once again. The ventricles begin to relax, reducing the pressure in the ventricles so that the atrioventricular valves open. The ventricles then begin to fill with blood and the cycle begins once again. Fig 1 – Pressure changes and important events within the cardiac cycle, a single cycle is shown. Damage to the heart valves can cause them to become narrowed (stenosis) or leaky (regurgitation). Either of these conditions can lead to turbulent blood flow which is heard as a humming sound on auscultation of the heart. These sounds are known as heart murmurs. 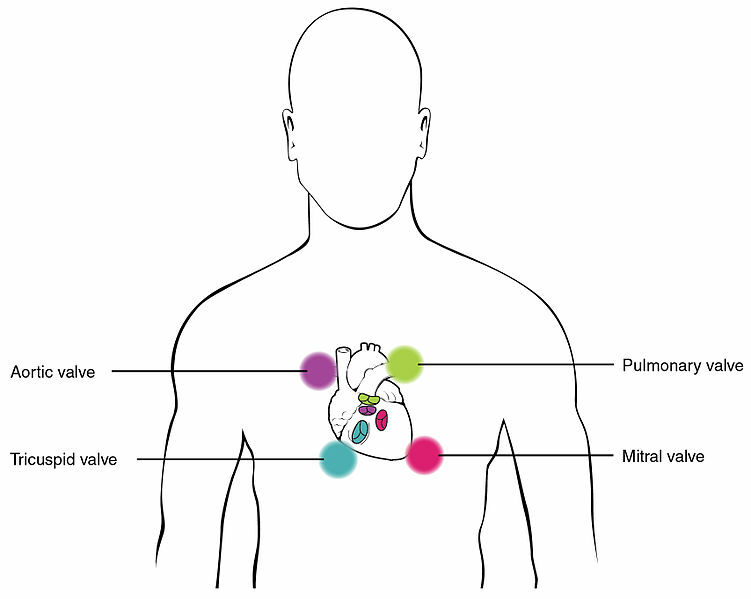 Fig 2 – Surface anatomy of the best locations to auscultate the four heart valves. S3 : this sound can sometimes be heard early in diastole (following S2), in young people or athletes it is normal, however in older patients it often indicates congestive heart failure. It is caused by deceleration of blood moving from the left atrium to the left ventricle. S4 : this sound can sometimes be heard during atrial contraction (late diastole, immediately before S1) and is associated with reduced ventricular compliance (“stiff” ventricles) or left ventricular hypertrophy. Thinking of average pressure differences, which of the following statements is false? During which phase does most ventricular filling occur? During which phase will the ventricles experiences the steepest rise in pressure? What does the second heart sound (S2) correlate to? Which of these cannot be a murmur?